Oh…how I wish it had been that simple. When our neighbor came bearing peppers from the garden, that’s exactly what I should have done – bit into one to determine how hot they were. Instead, my fingers did the testing for me. When you have chopped a certain number of chiles, you may think you know what you’re doing (and that’s always a dangerous assumption). Or maybe my system just reached its capsaicin threshold. But halfway through chopping more than a pound of what I thought were normal, moderately spicy banana peppers, my fingers were tingling. I washed them in plenty of soapy water, donned the gloves I should have been wearing all along, and went on chopping. By the time the pepper rings were submerged in their vinegary brine, I was ready to submerge both my hands in a bowl of ice cubes for a couple of weeks. I had no idea that the intense burning sensation caused by the capsaicin in the peppers could endure so many soapy hand-washings. Or that the pain could be so bad that I found myself staring at my fingers in amazement, sure that any burning sensation so intense should have manifested itself in enormous blisters. Doing some blitz internet research (not easy with fingers on fire), I discovered that the substance in chiles that creates the neurological feeling of heat – capsaicin – bonds to oil or alcohol, rather than water. So once it gets in the pores, water is not going to be very effective in washing it away. Put the hands under hot water to open the pores (which nearly made me scream). Scrub with soap under water, dab dry. Then dip hands in vegetable oil (which I rubbed into the areas that burned intensely). I added a dose of alcohol afterwards (no, not for me, for my fingers) in the form of hand sanitizer. The hot water opened the pores, and the oil and alcohol bonded with the capsaicin to help remove it. Not only did it sound scientific…after repeating three or four times, it worked. And actually, the pepper rings are pretty good, in moderation, especially on hot dogs or brats. And they’ll be a great topper for a bowl of chili. And next time, I’ll taste before I slice…and wear gloves. Bring the vinegars and water to a boil in a small saucepan; remove from heat and stir in the spices, sugar and salt. Allow to steep at least one hour. 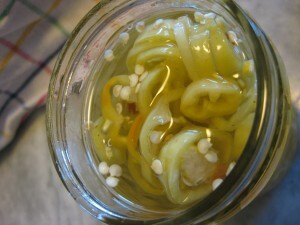 Place the pepper rings in clean glass jars or bowls; pour the vinegar solution over to cover. Cover and refrigerate a minimum of 24-48 hours. To serve: Sprinkle a few peppers over anything that needs pepping up, such as brats, hot dogs, sub sandwiches, pizza, chili, soups, breakfast cereal or long-running TV situation comedies.